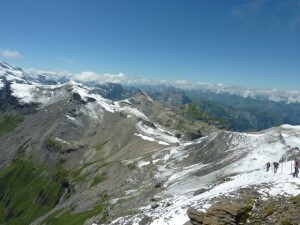 This is the view from Schilthorn, which is one of the tallest Alps, and where On His Majesty’s Secret Service was filmed. Here’s the general area. We’re about 20 minutes outside of Zürich. Wetzikon is a large town for Switzerland, having a bit more than 10,000 people. 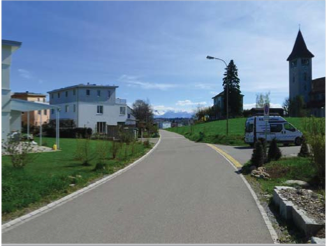 In the time we have been here, Wetzikon graduated from a Gemeinde – or commune – to a city. This is our neighborhood. The church tower you see there chimes on the quarter hour. 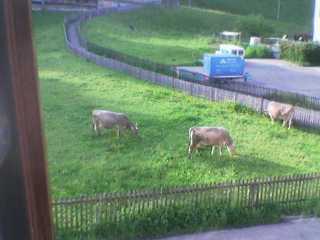 There are many cows in Switzerland. It’s not the most economical animal, and the cow is, among other reasons, why the Swiss aren’t in the WTO. The Swiss have a number of trade barriers in place relating to agriculture. This is because there is a concern that removal of those barriers will be the downfall of mountain-side family farming. Cows on a mountain are particularly uneconomical. 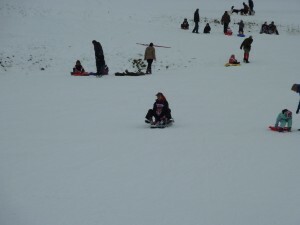 We do tend to get some snow. There are lots of little slay hills all over Switzerland. This little one is about 10 minutes’ drive from our house. 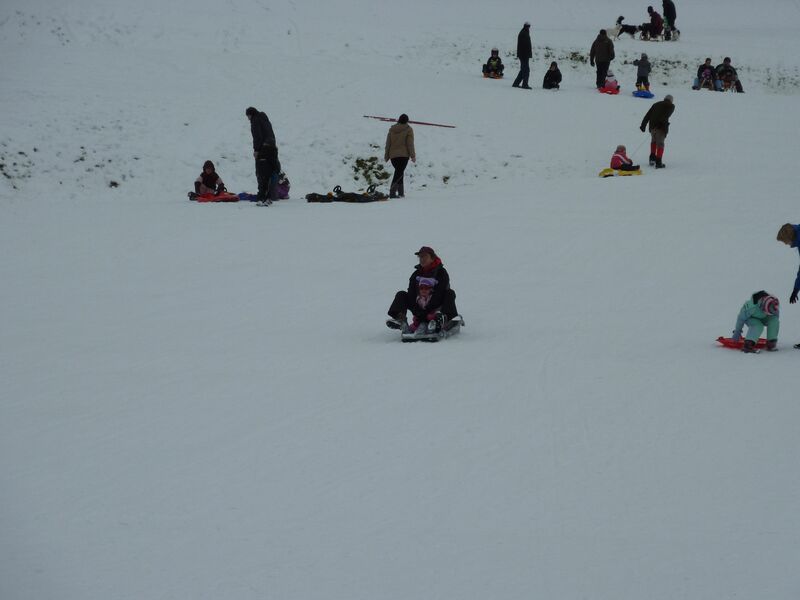 There is also a small ski lift. The astute will spot me in this photo. 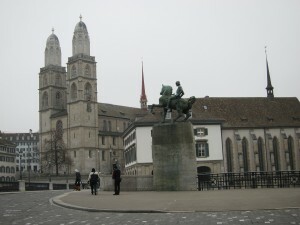 This is Grossmunster, which is a church in Zürich. 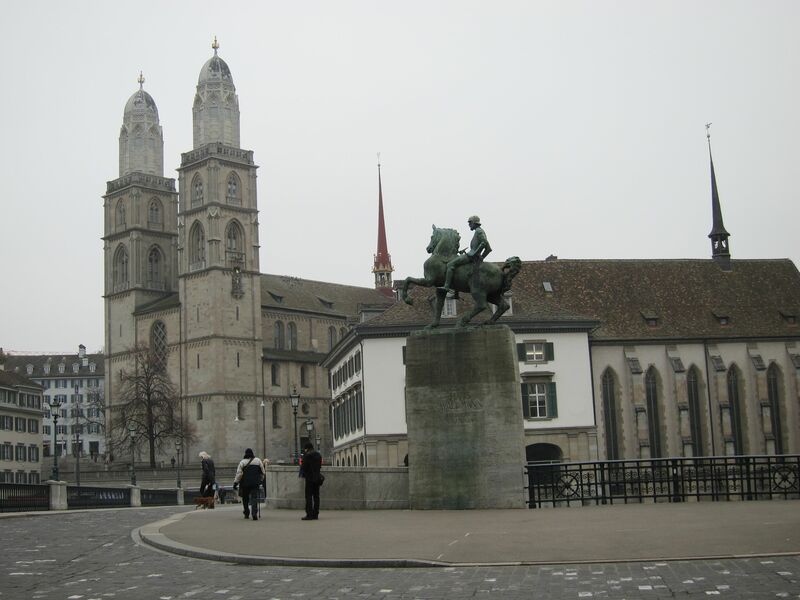 Switzerland has a lot of churches. Wow, your neighborhood looks lovely! So much open space (says the girl who lives in the suburban NJ cookie cutter development). Schilthorn is amazing too. How lucky you are to live in such a beautiful country. How do you like it? Do you ever miss the USA? Elliot, you should blog more about being an ex-pat living in Switzerland….I am sure I wouldn’t be the only one interested in what life is like there! Thanks so much for posting….I have such wanderlust but know that the only travel I will do in the next 10 years or so is to places like (gasp) Disney, Seaworld, etc. Looking forward to seeing more.